It's the latest trial designed to inject stem cells into patients' spines. The trial is supposed to show that the drug - stem cells, in this case - is safe, although researchers hope to provide some benefit as well. In 2009, California-based Geron Corp. not only injected the first stem cells into a patient's spinal cord, it was the first to use the highly controversial derivative of human embryonic stem cells. But after treating at least four patients, the company chose to shut the trial down in 2011 because of its expense and the company's focus on cancer research. One week later, Neuralstem began its clinical trial in patients with amyotrophic lateral sclerosis, also known as ALS or Lou Gehrig's disease. That trial used a new device to inject stem cells into the spine without causing additional injury to the spinal cord. Neuralstem's cells are not embryonic stem cells but rather cells taken from fetal spinal cords, which have already started to become nerve cells. California-based StemCells Inc. launched spinal cord trials in Switzerland in 2011, using its own type of neural stem cells also derived from fetal tissue. It injected its first North American patient in Canada this year. Unlike the goal of the Geron trial (similar to StemCells'), which was to re-mylenate nerve cells to re-establish connections from the spine to the brain - like fixing an exposed wire by providing a new cover - the goal in this new trial is to "actually build new circuitry," Neuralstem CEO Richard Garr said. "The stem cells are injected directly into the area of the injury and jump the gap with the new circuitry we've built," he said. "These cells don't migrate to the site." 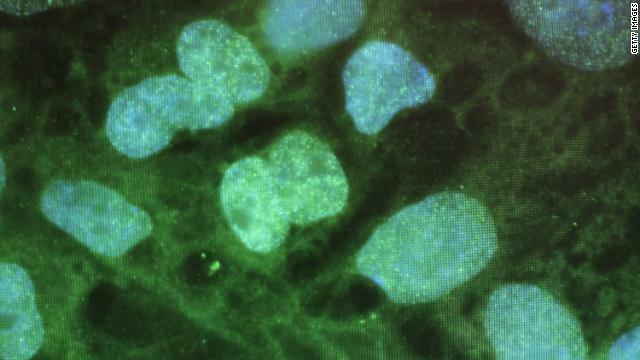 In animal experiments, rats were injected with these human stem cells and recovered significant function in all lower extremity joints, according to Neuralstem. "The cells turned into neurons which grew a 'remarkable' number of axons that extended for 'very long distances,' bridging above and below the point of severance," the company says in a statement, quoting study results from August 2012. Neuralstem is trying to reconnect the nerve cells from below the injury site to cells above the point of injury to re-establish signals going to the brain, says Karl Johe, the company's chairman and chief scientific officer, who developed the cells. Johe says he hopes the first patient will have the surgery to get the stem cells by July. "And then it would occur about once a month," he added. As for the most recent research, which discussed a much simpler method called epidural stimulation, Johe says it's a complimentary approach. This month, researchers showed that four patients who had had spinal cord injuries for more than two years were able to 'reawaken' their muscles, so to speak: move their legs when electrodes implanted in the back were turned on, providing electrical stimulation to the spinal cord. "There has been debate whether the motor neuron circuitry is intact below the injury point," Johe said. "So now we know for sure (it is)." A small mammal is not a human. How do you stop the human from rejecting fetal tissue? Self derived stem cells are a better solution. Peter-These are neuro stem cells and don't get rejected. They have already been using these same cells in an ongoing ALS trial now in phase II. Initially immune suppression drugs are used in the beginning but during the ALS trial several patients stopped the immune suppression therapy and the bodies were not rejecting the cells. This is evident in the progress of the ALS patients as well as in autopsy analysis of the the cells during the phase I trials where the cells were still evident irregardless if the participant was on rigorous immune suppression therapy or not. Better question - How do you stop a closed mind from rejecting science? Kindly read the peer reviewed study reports before commenting. I am a practicing Neurosurgeon in India. We had some experience in treating patients with spinal cord injury with stem cells here. The most intriguing factor in stem cell research is 'heteromorphogenicity' (or a lack of it) of these cells. We do not know when and how these cells transform in to neural progenitor cells. The researches like above have shown some encouraging results in rats. These rodent studies need to be put in perspective before any conclusions are drawn in human beings. Unfortunately we did not have any desired results in spinal cord injury. We also tried intralesional stem cell injection (injecting stem cells directly into the site of injury) with no significant benefits. We have to fully understand the mechanism of transformation of these cells before extrapolating the same on human subjects. Till that time, we should refrain ourselves from indiscriminate stem cell trials, else the whole subject will lose its steam midway. They actually had results in multiple animals, including a pig with a genetically altered spinal cord that replicates a humans. Great article!! I work for a urology device company called New Britain Medical Supplies! We pride ourselves in the support we give to SCI patients. Check out our website: http://www.NewBritainMedicalSupplies.com. I am a T5 SCI paraplegic for the past 15years.I am from Nigeria.Its encouraging to read about the epiduaral stimulation and I hope it will bring about a lasting solution to SCI sufferes across the globe.Please I am interested in knowing how we Africans especially Nigerians With SCI can be a part of the research and clinical trials been conducted across the globe?